Micronics flow meters are suitable for use in many measurement applications in industries including building services, water management, power, food/beverage, mining and agriculture requiring portable or fixed non-invasive ultrasonic flow metering. For over 30 years Micronics have been developing their ultrasonic clamp on flow measurement products – since then Micronics have sold their clamp on ultrasonic flow meters to more than 50 countries worldwide. Their product range now has 13 different offerings to meet the users exact requirements. Micronics are specialists in ultrasonic liquid flow meters with a tradition of innovation and a well established world position. 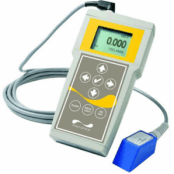 Micronics are manufacturers of high quality portable flow meters. Portable flow meter solutions are ultrasonic, clamp on and non-invasive, for closed pipe and open channel applications – this means no interruption to process and no downtime whilst the portable flow meter units are installed. Micronics flow meters includes the portable ultrasonic doppler flow meter, portable ultrasonic clamp on flow meters, fixed ultrasonic clamp on flow meters and a range of complimentary accessories. 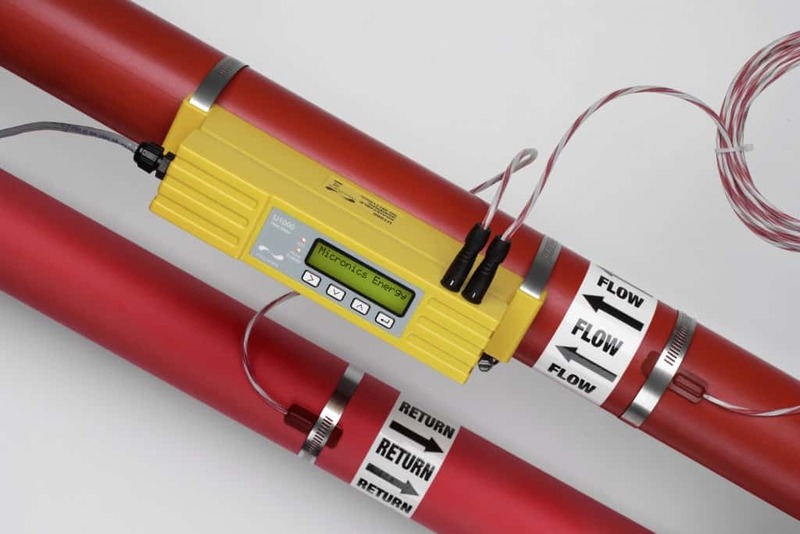 The flow measurement range uses “Time of Flight” or “Doppler” technology and is available in portable and fixed options using non-invasive ultrasonic sound transmission to detect liquid flow velocity within closed pipes or open channels. 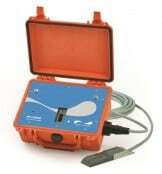 An ultrasonic flow meter measures the velocity of either a liquid or gas using the principle of ultrasound. 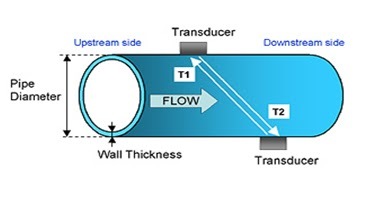 By using ultrasound transducers, the flow meter can measure the average velocity along a path of an emitted ultrasound beam. Ultrasonic flow meters can be combined with a heat calculator that allows the user to regularly check their energy costs. Micronics flow meters have been developed over many years and are most commonly used in the building services/energy management industries – suitable for low conductivity liquids and non intrusive for sterile applications. Non-invasive flow meters have the advantage of not interrupting flow as they don’t require any maintenance so there is no downtime once the meter has been installed. Easy to use, simply clamp on the meter to the exterior of the pipe and a reading will be provided using ultrasonic technology. This results in an uninterrupted flow and therefore greater system efficiency and easier meter readings. No specialist training is required to install ultrasonic flow meters. Ultrasonic flow meters identify leaks and blockages and monitor flow, resulting in a decrease in waste production. Micronics U1000 fixed clamp on ultrasonic flow meter is a new smart solution to thermal heat/energy metering. The ultrasonic flow meter is simple to install and is able to produce highly accurate readings helping the user to save money. Not only does the U1000 have the ability to measure the flow rate with volume pulse output, it has an optional optional 4-20mA flow rate signal that can operate by itself or as part of an aM&T or BEM’s system. Micronics U1000 is a fixed metering solution that is simply installed on the outside of the pipe removing the need to cut the pipe. Retrofit savings on existing heating and chilling plant are obvious, eliminating the need for expensive drain down, pipe cutting etc. Suitable for use in industrial environments due to rugged and compact design helping the flow meter sustain performance. 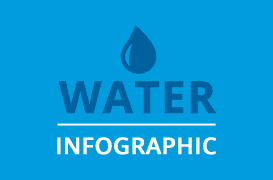 The U1000 is a simple ‘out-of-the-box’ solution to metering requirements and is a more cost effective solution than the traditional inline water meters. 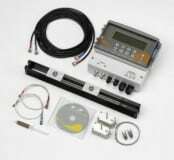 No engineer is required to install the meter reducing downtime to a minimum. The installation consists of placing the meter on top of the pipe, selecting the pipe size on the screen, securing the Micronics U1000 meter and connecting power and temperature sensors. Clamp on flow meters use Transit Time and Doppler technologies for accurate flow measurement that is non-invasive. Both technologies require two transducers that are installed to the outer surface of the pipe. One of the transducers transmits the ultrasonic signals whilst the other receives them. 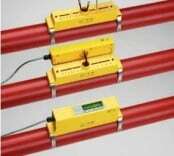 These transducers are used to create pulses which pass through the pipe. Learn how transit-time ultrasonic flowmeters measure flow in this Micronics video. Micronics have vast experience in developing flow meters to suit a range of different industries. Mainly used in the building services/ energy management to monitor and reduce carbon emissions. Energy efficiency requires highly reliable flow metering solutions which Micronics are able to offer. Micronics range of fixed clamp on ultrasonic flow meters including the newest additions U1000 and U3000. Both meters are a suitable alternative to in-line meters for HVAC meeting in both new build applications and retrofit. The advantages of these types of flow meters are they are easy to install, minimize downtime and require little maintenance. Micronics flow meters have been specified and installed by Lodge Cottrell one of the world’s leading specialist in air pollution control. Micronics PF330 clamp on flow meters are installed for temporary flow measurement requirements, such as commissioning and set up of water flow lines. The water flow rate needs to be specifically measured to ensure that the slurry is of the correct consistency from the plant. Founded in 1985 Micronics have been developing and designing clamp on ultrasonic flow meters incorporating “Time of Flight” or “Doppler” technology providing flow measurement solutions for a broad range of industries.